Shopping for Monty Python Plush? Dismemberment fun for boys and girls of all ages! Take out your frustration on the noble Black Knight! This poor fellow needs a hand... or is it a leg? It's time to have fun with dismemberment! 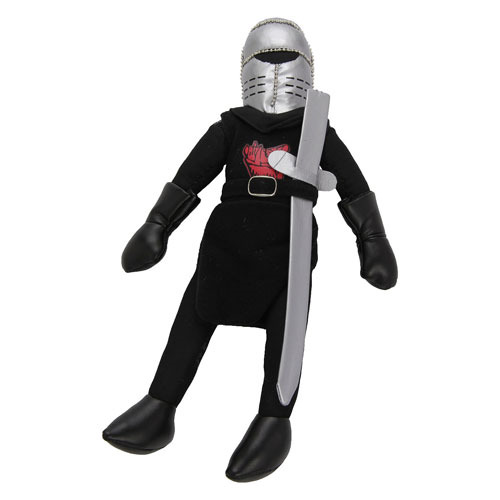 From Monty Python's The Quest for the Holy Grail, comes this 14-inch Black Knight Plush. He features amusing details from the very special universe of Monty Python, including Velcro-assisted memberment and dismemberment. In the process of defending his territory, your knight may occasionally part with one or all of his limbs. Don't panic! This is a natural defense mechanism on the part of the knight, and rarely fatal. This guy is one sure way to get a leg up on your friends! Take care of your knight. Like a hamster, the Black Knight enjoys his solitude and doesn't get along well with others of his kind. Or, truth be known, with others at all. The knight does best in an environment of pathways, bridges, escalators, or other thoroughfares. Naturally territorial, he will fiercely defend his chosen area against all other knights, door-to-door salesmen, or unsuspecting souls headed down the hall to use the restroom (one reason why Black Knights are so popular at frat parties).